I couldn’t resist this big, beautiful ‘coffee-table’ book when I saw it at the library. I’ve been fascinated by Peggy Guggenheim (1898-1979) ever since I read somewhere (The City of Falling Angels by John Berendt??) that she insisted that her musicians all jump (fully clothed) into the Grand Canal one frivolous night. We missed visiting the Guggenheim collection in Venice because it was closed on our last day there, but last year when we went to Spain we visited the Guggenheim in Bilbao. Confronted by this vast magnificent gallery of modern art, and knowing also that she had endowed yet another one in New York certainly made me aware of her enormous wealth. I was keen to find out where her money came from, and why it was that she became such a generous patron of the arts. This book, although a little gossipy, fills that gap. It explains how the Guggenheim family made its astonishing wealth: Meyer Guggenheim started out peddling imports and then invested in mining and smelting to make one of the largest fortunes in 19th century America. With lavish photos the author then shows how they spent some of it! The houses they built were sumptuous, and the portraits show their luxurious lifestyle. (The clothes are gorgeous, and there is even a photo of Peggy ‘s son Sindbad, as a toddler, in a flamboyant fur coat). But Peggy had more than her share of tragedy: her father died a hero aboard the Titanic and her love life was a disaster. Her impulsive marriage to Laurence Vail ended in divorce, not long after her beloved sister Benita died in childbirth. Worse, the divorce settlement meant that while Peggy had custody of her daughter Pegeen, Laurence had custody of Sindbad and she didn’t see very much of him. Many in the American expat community who enjoyed a lavish European lifestyle between the wars, had to trim their sails a little when the Great Depression struck and make their way back to America, but Peggy Guggenheim stayed on in Paris with her new lover John Holms. Tragedy struck again when in England for a holiday he had a fall from his horse, broke his wrist and died of heart failure under anaesthesia to repair the break. She then went into a premature relationship with Douglas Garman and suffered serious depression. (It wouldn’t have helped that he became enamoured of communism, insisted on having only visitors who were also communists and had affairs with young and pretty party workers on the side). Her good friend Peggy Waldman came to the rescue with the wise advice that Peggy needed an interest to keep her active and meeting stimulating people. She suggested doing some serious work in the arts, and so it was that Peggy Guggenheim began her lifelong support for art and artists. (She took a new lover too, Humphrey Jennings, a surrealist painter, photographer and poet, but that didn’t last long either). Mentored by Marcel Duchamp, Peggy soon mixed with a veritable who’s who of the modern art world, and the rest is history, as they say. She became the most important collector of modern art of her generation and established the careers of many notable artists including Wassily Kandinsky and Jackson Pollock. She collected and exhibited everyone from Henry Moore, to Pablo Picasso and George Braque. Escaping three days before they occupied Paris, she managed to evade the Nazis and protect her art works, and she ensured their longevity through her extraordinary philanthropy. Her private life continued to be turbulent. In 1937, she fell for the taciturn Samuel Beckett, and had a rival in the daughter of James Joyce, Lucia, who fancied him too. She married again in 1941, to Max Ernst, and divorced him, and apparently had numerous lovers. She was a kiss-and-tell lover, publishing her memoirs while most of her conquests were alive, and apparently enjoyed the furore that not surprisingly ensued. 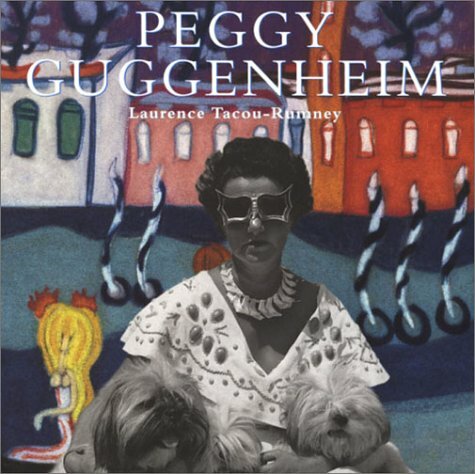 Peggy’s daughter Pegeen died in 1967 of a drug overdose, and this book was written by Laurence Tacou-Rumney, a Parisian journalist married to Sandro Rumney, Peggy’s grandson. It is translated by Pegeen’s husband, the English artist Ralph Rumney. It is too candid to be a hagiography, but it is interesting that it makes very little mention of Sindbad’s fate. All I’ve been able to find out about him is that Peggy didn’t will him so much as one painting’. For a completely different (and somewhat liverish) take on Peggy Guggenheim’s life, see this review of another biography by Anton Gill. I have been intrigued by Peggy G for years. Few people seem to carry off great wealth, at least she had a good steer to the arts for a lasting contribution. It was nice to see the lovely portraits of her as a child and a young woman. The picture they have of her on Wikipedia is horrible! Not Guggenheim, but I was in the Phoenix Art Museum two weeks ago and they had a small room dedicated to works from the collection of Herb and Dorothy Vogel, a New York couple who began buying modern art in the 1960s without even the benefit of Peggy’s “only 2.5 million” — both employed, one in a post office, one in a library, they lived on a single salary and spent the other on drawings, paintings, minimalism, objects, and experiments. Recently they donated more than half the collection to the nation. Inspiriting, that dedication, followed by that generosity. Yes indeed, and I’ve known a couple of avid collectors of this and that who’ve had similarly generous impulses. Apart from anything else, it keeps the collection together. What a pity they couldn’t be kept together … but then again, I guess it’s nice to spread the generosity around. Thanks for this interesting insight into an interesting woman Lisa. I don’t really know anything much about the art world, particularly modern art, and indeed only learnt who Marcel Duchamp was in the past week or so…. My son is doing a project at the moment on art, so I’m learning quite a few things I didn’t know. I do love that Guggenheim building in Bilbao, I’d so love to see that one day.